Titus 2:3-5 – 3 (C)Older women likewise are to be reverent in behavior, (D)not slanderers (E)or slaves to much wine. They are to teach what is good, 4 and so train the young women to love their husbands and children, 5 to be self-controlled, (F)pure, (G)working at home, kind, and (H)submissive to their own husbands, (I)that the word of God may not be reviled. We all have favorite passages in the Bible. Many times we have memorized certain verses or sections in Scripture because those verses inspire, convict, encourage, or challenge us. This is definitely important for us to do, however, I wonder how many of us have forgotten the context surrounding those favorite verses. The verses for this week may fall under that category for many women. 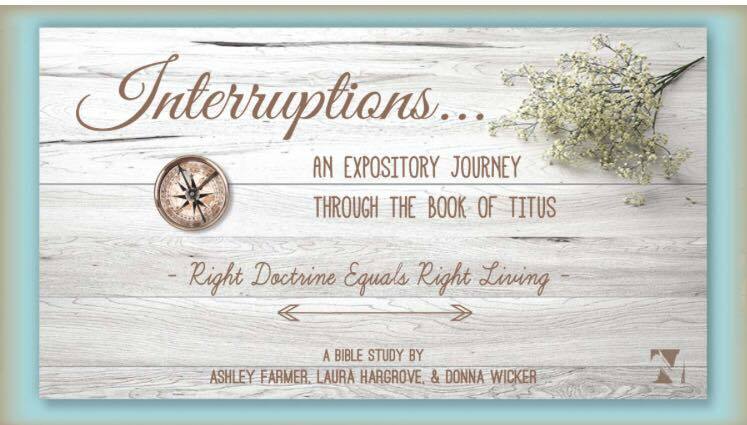 You may have heard about the “Titus 2 woman” – she’s the twin sister of the “Proverbs 31 woman.” Chances are, before this study, most of us had no idea what the other verses in this letter even had to say. We will see how the Titus 2 woman fits into the greater picture of Paul’s message to Titus and the Cretans. What is the greater picture? It’s simply this: The reality of the gospel is best seen in the transformed lives of His people. This is why Paul writes to Titus and the Cretans, giving the believers practical instructions for the living the Christian life. Perhaps the Cretans wanted to know if the Word of God had credibility. How would the followers of Christ live in the depraved culture of Crete? This was their chance as believers to illustrate with their very lives the power of God to change their hearts. Women of God, adorn yourselves with the priceless jewels of sound doctrine and holy living so that you may glorify God in all you do, wherever you are. One of our greatest challenges as we seek to understand the Scriptures is to 1st admit our own biases (because of faith tradition, experiences, our culture, etc.) and 2nd to make certain that we let God’s Word inform our views rather than letting our views inform how we read the Word. So when we read the Scripture, are we going to believe what it says and allow the Spirit to interrupt our views in order to more accurately align us to the Truth? Or are we going to say, this teaching is too hard and I’m not going to believe in this out-dated, old-fashioned, entirely too conservative view? God give us wisdom to discern the meaning of your Word. Give us hearts that are humble and submitted to You. May we never seek to be culturally appropriate (PC), discarding biblical accuracy. This letter to Titus is evidence that Paul saw no mission too difficult for the person of Jesus Christ. He wanted the gospel to spread to the older men and youth, to the older and younger women, and also to the slaves. He knew that the gospel had made a difference in his life, and he knew that it would impact and change forever the lives of those terrible Cretans! Paul’s “missionary and pastoral concerns are clear. As new churches are established their credibility will depend upon the authenticity of the lives of those who claim to have been transformed by the grace of God (Titus 3:3-7). It is crucial that those recognized as leaders in those churches both exemplify such living for the Christian community and maintain the integrity of the church’s witness in the wider society.” (Wieland in “Grace manifest”). Paul uses that word likewise, connecting his instructions for women to those of the men (v. 2). Before we go over the specific words in this verse, let’s get things out into the open, by addressing the issue of women teaching in the church. In 1 Tim. 2:12 Paul writes, “I do not permit a woman to teach nor have authority over a man” but here in Titus 2:3, Paul expects the “older women” to teach the younger women. We already begin to see that this was not a matter of whether women should teach but rather WHO a woman should teach (Kostenberger p. 98). The reason for the prohibition? Paul “appeals to the created order, the good and perfect world God made, to justify the ban on women teaching men.” He writes that since man is created first, God has given him authority over woman and that this authority was not a result of sin or the fall (p. 177). Paul tells these women to be reverent and connects this with not being slanderers or drunkards. Greek lexicon – meant “reverent, venerable”. This word is only used in this verse. In other words, the kind of character building that takes place within the home is just as important as the service that happens in the temples. Let’s face it, who in here has ever felt like what you do in the home is not highly valued or appreciated? That it doesn’t seem as important as what someone else does as a minister or missionary? You can see what a high calling it is then for Paul to encourage these women to be reverent, like priests, whose purpose was to serve God and intercede on behalf of His people. Their work in the home could be seen as service to God, not drudgery. Other translations translate this word as “gossips”, but I actually prefer the word slanderer because it gives us a much more poignant image. Now you understand the word “diabolos”. In fact, this word diabolos is used 35 times and 32 of those times this word is translated as “devil”. The other 3 times it is translated as “malicious gossip” or “slanderer” (like here in Titus and 1 Tim)! The devil is called our adversary, the accuser, the one who slanders. We tend to distance ourselves fairly well from the act of gossip. We know it’s a sin, and we don’t want to be considered a malicious gossip. Yet I wonder how many times we have said something to friend about another person that has left our friend with a lesser view of that individual. Ouch. That’s slander. That’s acting in line with the evil one, our adversary, the one who accuses and slanders. We are called to a higher standard, and we must rise to that height. This phrase kind of cracks me up. It’s seems to be a nicer way to refer to being drunk. And you know what wine can do to your tongue. It can make it loose and prone to gossip/slander. Maybe this is why Paul pairs these two vices together. Again they were to be “sober-minded” both literally and figuratively. I don’t believe this phrase needs much explaining. Perhaps these women were tempted to drown their troubles with “much wine.” At least, that was what they were accustomed to before meeting Christ. Paul is instructing them that their behavior now is to be reverent, like a priest, not irreverent like a drunk. Instead the women were to spend their time teaching what is good. Paul writes to the Philippians, (4:8) “8 Finally, brothers, whatever is true, whatever is honorable, whatever is just, whatever is pure, whatever is lovely, whatever is commendable, if there is any excellence, if there is anything worthy of praise, think about these things.” (LOVE WHAT IS GOOD) These are the good things. Anything that’s true, honorable, pure, lovely and so on. As a younger woman, I want you who are older (whether that means one year or 50) to know how valuable you are to the Body of Christ. Never for one minute believe that you have nothing to offer. You have been given the task to teach what is good. That can look like teaching skills or teaching character. It can be informal or formal. That can look like spending time with a younger woman and sharing your story of how you have walked with Christ over the years. That can mean you open your eyes to discern where younger women may need encouragement or instruction, even correction. It means being a mentor and building intentional relationships with other women. It means your work here is not complete, and we won’t let you off the hook because we desperately need you. And to the younger women I say, we need these mature women in our lives! When you feel alone and like life is completely overwhelming because of the juggling act you do of managing the home, working, and raising your children, please know that you weren’t meant to struggle alone. Life was meant to be lived in community. So don’t sit at home silently struggling because there are so many women who would be eager to walk beside you to encourage and teach you what is good. Besides, they want you to know that they struggle too, and I’m certain they would tell you that those struggles help them realize their need for God. Just to be clear, I believe every woman has something to offer, whether young or old (er). The point is that we are the sisterhood! We need to be cheering one another on to love and good deeds. We must love one another genuinely and put that love to work by helping and caring for each other. Here is kingdom work. Here is a priestly task. In this verse contains the simplest command with the most challenging application. This is the area in which the younger generation needs the MOST help. Before I get into the meaning and application of the words, I do want to be sensitive to those who may not have husbands or children. These are instructions for how to love both husband and children, but you are not forgotten. Other translations may use the word “encourage”, but I like the word train because of the implication that this takes place as a continual and intentional teaching. Training up the next generation. However I love that within the training, encouragement also takes place. To encourage means “to give courage to; to give or increase confidence of success; to embolden; to animate; to inspirit” (Webster’s 1828). Perhaps you can encourage this woman by showing her what God says about the importance of her role in her children’s lives. That though she may feel overlooked and underappreciated, she has the affection and attention of her heavenly Father who sees all the work she does and tells her it’s never in vain. Maybe she simply needs to know that when she’s feeling worn out and empty, her God sees and hears and knows how to fill her back up so she can continue pouring Him out to those around her. It was very common for marriages to be arranged during this. So that may explain why Paul instructed the older women to teach the younger to love their husbands. I don’t think that necessarily meant that they were doing a poor job of loving their husbands. It’s more likely that they simply didn’t know them prior to the marriage arrangement (so perhaps weren’t “in love” as we say these days). Regardless of this cultural nuance, Jesus teaches that we should love one another. The love must start in the home, and the teaching must be from the Word. We all know it feels easier to love others, but not quite as easy to love our husbands and children. What I mean is that we aren’t always as nice to our family as we are to our friends and acquaintances. Perhaps this is Paul’s reminder for them all to take a good hard look at those who are closest to them and to give them the kind of love that they so eagerly give to others. To the older women, I would say: teach the younger women what it means to love. You have experience under your belt, and the wisdom to know how to apply it. We need women who are willing to say, “here’s why it’s important to love your husband first” and then explain how to do it. Even the act of talking about your love for your husband is enough to encourage a younger woman to love her hubby. Tell us about the kind things you do for your husband. Tell us what you did when you weren’t feeling the love but made the choice to love anyway. Speak about your husbands in ways that show you respect him so that this models for us how to respect our husbands. Tell us what it means to submit, and show us that it’s really not a dirty word. As for children in the Greco-Roman era, they were not viewed the same way we view children today. Children were valued as they contributed to the larger society as a whole. A second difference is that children weren’t always raised by their parents. They often used nurses and educators to help train their children. Thirdly, most children grew up in poverty because there was no middle class – only very poor or very rich. And fourth, children in this time were often exposed to extremely violent and socially disruptive experiences. For example they were not sheltered from public executions or torture, and they were often beat as a way to produce self-control and other virtues in the child. These children did not have what we would call a “happy childhood”. They weren’t given the chance to “just be a kid.” They were expected to work their chores, learn their parents’ trade, and learn moral lessons for the development of their character. And again the goal was for them to be productive members of society first and foremost. Again I’m not saying that these parents didn’t love their children. On the contrary, they loved them so much that they provided ways to help them advance in their culture. Yet again Paul writes for the women to love their children. The call to love was paramount for Christ’s followers, and it had to start first in the heart and then in the home. Older women, encourage us to love our kids. To remind us that the time goes by quickly and that we need to cherish the moments rather than wish them away because we’re tired. Show us what you did to love on your kids. Urge us not to waste our time doing too much housework or on too much media or on too much of our selfish past times. Help us to see the value of quality time with those little ones. Teach us about what you do to balance all the roles you have. Perhaps all we need is to know that we’re not alone when we say we feel inadequate as moms and teach us that God has made us adequate as His servants in all areas He’s given us. Younger women, let’s have a heart of humility when receiving this instruction. Let’s stay away from comparing our lives to another sister’s life. (I’m better than her. She’s better than me…) Let’s also avoid falling into the guilt pit. I can tell you this, your adversary, the one who slanders will whisper (or shout) general, accusatory statements (I’m a terrible mother, I’m a bad housewife). He heaps on GUILT with the goal to steal, kill and destroy you. But your God, the one who transforms and corrects will whisper (or shout) specific, convicting or encouraging statements (I called you to love and gentleness in your speech. What you said today to your son was harsh. You need to go apologize and try that again.) God brings CONVICTION with the goal of your SANCTIFICATION. 5 to be self-controlled, pure, working at home, kind, and submissive to their own husbands, that the word of God may not be reviled. I remember in my high school years thinking that I needed to try to be self-controlled, pure, kind. And if I wasn’t any of those things, that I needed to try harder. I had gotten it all wrong. It is the work of the Holy Spirit that produces this fruit in our lives. It’s also about being disciplined, it’s about self-denial. It’s about choosing a life of holiness and saying no to what is impure. It’s about choosing kindness instead of responding harshly. I wonder how many of you bristle when you hear this phrase simply because you are reading it from the lens of our culture which happens to lean heavily toward feminism and women’s rights. Perhaps some of you honestly thought I was going to tell you that this passage teaches that all women should be stay at home moms. It doesn’t. But there is something to be said of those gnawing feelings in our gut when we encounter a passage like this one that makes us feel a tad uncomfortable. I cannot say what you should do, but perhaps God has spoken to you on this subject. Don’t go away sad, like the rich young ruler, but rather hear the words and consider how you can be obedient to His calling, whatever that looks like. It seems like the appropriate time to address (very briefly) the Biblical teaching of womanhood. I think it is wise to acknowledge that submission to God’s authority (and therefore Scripture’s authority) is counter-cultural. Our culture views the Biblical teaching on men and women as out-dated and even offensive. But our culture should not be our standard. Our culture should not inform our view of men’s and women’s roles. Only God has that authority, and we must allow His Word to penetrate through that lens of culture. Women were given the role to be workers at home. That is undisputed. What is disputed is how that looks lived out in everyday life. We will delve into the application of this now. You can see how this kind of habit would result in a word of correction for these women. Perhaps they were neglecting what needed to be done at home in order to socialize and even gossip. Thus Paul tells them to manage their homes. Not to forget or neglect it. NASB says, “workers at home”. NIV translates it as “to be busy at home”. NLT says, “to work in their homes”. NIRV writes “take good care of their homes”. The Message simply says, “keep a good house”. Amplified Bible translates it “makers of a home [where God is honored]”. So there’s a mixture of management, good housekeeping, and creating a home where God can be honored. We’ve read every major translation, and already it is clear that this passage is VERY UNCLEAR about the meaning of “working at home”! Once again it’s anyone’s guess as to what Paul was really telling them. I like the idea of being a “guardian” of my home. Yet we can’t really understand this phrase apart from our own preconceived notions of gender roles. When in doubt about a passage such as this one, it is best to consider the whole counsel of God. Where else in Scripture can I gain understanding for this particular verse? She sounds like Superwoman, quite honestly, but this compilation of all the things a virtuous woman does reveals to us that a woman can “look well to the ways of her household” while still working outside of her home. Other examples of women in the Bible are Abigail (Nabal in 1 Sam 25), the women who supported Jesus’ ministry (Luke 8), Mary/Martha (Luke 10), Lydia (seller of purple goods Acts 16), and Paul lists multiple women who were “fellow workers” with him (Romans 16, Phil 4). If you are not certain what to do (to work only at home or to work outside of the home), or if you’re not sure whether this passage means for women to keep a clean home, to manage finances or the household, to raise your children, or whatever – Let’s first consider the true intent of this principle. Cultural fads will change, philosophies will go in and out of style, but the true intent of what it means to be “workers at home” will not change. To be workers at home at its core means the home is where our primary focus should be (secondary next to your relationship to God obviously). The home is primary, so you can ask yourself, am I giving my best energy and attention to my home and if not how should I adjust my time or attention that would redirect my focus where it should be? Rest assured you can work outside the home and still have your home as your primary focus. Likewise you can stay at home and be focused on everything but your home (children/husband). Once again though, what would obedience look like for you in this area? How is the Spirit using this passage to convict or encourage your heart today? I’m going to move on now because this term relates very closely to the next phrase. Comes from two Greek words hupo (under) and tasso (to arrange/put in place). Tasso refers to an authority structure presently existing that is put in place by God. Also speaking of a person put into a specific position, to put someone over or in charge of someone or something. This word is so FULL of meaning that it’s hard to know where to begin! I want to start, however, with the part of the definition that defines Who puts someone into authority. It is God who places people into authority. Think of the steward whom the creditor left in charge. The money he was given did not belong to the steward, but he was still responsible for what he did with that money. Or for a modern day example, we can say that God has given us children and we are in authority over them though we are still only His stewards (because they still belong to Him at the end of the day). The parent-child structure is one that exists because it was placed there by God. The word hupotasso carries a sense of responsibility for the individuals under our care and not the negative connotation of oppression or misuse of power by an overlord. What I love about this last definition is that it is a voluntary attitude that has as its goal the relief of a burden. I also liked that it is a cooperative action and does not give the impression that you are butting heads or fighting against one another. Now I know this too is a hot topic and perhaps this term makes you cringe so much that you can’t see straight to listen any further. Remember the Biblical teaching is that man was created first and therefore was given authority by God over a woman (Kostenberger, 174). I would think now is the appropriate time to show you the cross reference for this term. But if we think of submission in the context of a loving, Christ-centered relationship in which your goal is to cooperate and help carry a burden, the idea of submitting isn’t so bad. If we know this is the “ordered structure” that God put into place, we can trust that there’s a reason for it. However I understand that not every woman has a loving, Christ-centered relationship with her husband. Some men truly are like the harsh overlords who want to rule over their wives with iron fists. This is also their struggle after the fall. God has given each woman the gift of womanhood. You aren’t meant to be like a man. You were created as a woman. It’s GOOD that you were created this way. You can celebrate your femininity and not see it as a thing to be rid of or free from. Nor do you need to try to grasp the role God gave to man. I liken this teaching on men’s and women’s roles to that of the roles God gives to His church. God has given each member spiritual gifts in order to serve His body. Paul is very clear that all members are important and serve a special purpose. Just because someone is given a certain role does not mean that their role is more valuable than your role. Role or function in no way implies inferiority or superiority of the members. Likewise we should not be jealous of someone’s gifting, seeking to take on that role we haven’t been given. We can be content that the Gift-Giver has generously given us the task we are meant to live out. Men can be men. Women can be women. And it’s beautiful. God designed a woman to care for the home in a way that takes the pressure off of the man (relieving a burden). It’s being a steward or a good manager, assuming responsibility for that part of your lives together. You’re working in cooperation with that husband of yours and in the meantime creating an environment that is nurturing and God-honoring. I realize there are women who do not ever marry, and to them I would say, you’re still managing a home! And to the single mom, I salute you. You’re doing so many extra jobs while still creating a loving/safe home for your kids. To manage a home is a special calling for us, one that many women don’t feel very qualified or even good at doing. Wieland writes, “The behavior of the younger women in their households is to be such ‘that the word of God may not be discredited’…. Though the world they inhabit may be characterized by [evil and selfishness] (Titus 3:3) members of the emerging Christian communities…” were to live above reproach. The real question is, what difference does the Word of God make in your life? And the real answer is, it should make your life dramatically different from the world. The real reason? Because this Word comes from the Father, it is God-breathed, and His Spirit changes us from the inside out so that we resemble God and not the world. So you want to make sure the Word of God is not blasphemed. Okay. Live. It. Out. How? You’ve got to be in it to know what it says. And you must be submitting to the Spirit who uses the Word to transform our lives. No longer following the flesh but walking by the Spirit. Finally, women teach, train, encourage one other with the Word of God. The idea of women mentoring women is a thing of beauty. We saw how Jesus elevated the status of women in our first “interrupted” series. Now as we read Paul’s letter to Titus, we are beginning to see how the status of women came to be viewed in reverent terms. The older women are like the priests who served in the temple and they are now called to train the younger women as their priestly apprentices, serving God. May we be a community of women who are devoted to God, dedicated to the truth of Scripture, and passionate about the spiritual health of our sisters in Christ. How does this process start? With God’s Word. His Word pricks our hearts and emboldens us to live it out! Many of you may feel a quickening in your spirit even today telling you that you can be a mentor to a sister. Be reverent. Okay, what’s one way that I can do that? Love your husband. Okay, what’s one way I can love my husband today? Love your children. Okay, how can I tangibly show my kids love today? Be kind. Okay, what kind thing can I do today? Let’s take a good hard look at this passage and decide to believe what it says. To take God at His word when He says that He will use His Word, through the Spirit, to transform our lives. Older women, are you teaching/talking/conversing the younger women? Younger women, are you listening to those who can give you wise guidance? Ladies, we are the sisterhood. Let us care for one another.